Across the tropics, what rainforests are to the land, coral reefs are to the ocean. They pack a tremendous diversity of plants and animals into a relatively small area. In addition to their recreational and cultural value, they provide a wide range of free “ecosystem services”: food for up to a billion people around the world, habitat for economically valuable fish species, sand for beaches, and protection from storms and waves. From global warming to pollution and overfishing, reefs face a collection of serious threats. Writing in the American Meteorological Society’s State of the Climate in 2017, scientists documented an unprecedented three-year-long, global ocean heat wave that stressed corals, causing them to bleach and die off at tropical reefs worldwide. Many coral reefs experienced mass bleaching back-to-back in 2015 (top) and 2016 (bottom). The likelihood of coral bleaching depends on how high the temperatures are above the annual monthly maximum and how long the unusual heat persists. Scientists track these conditions using satellite-based estimates of Degree Heating Weeks. 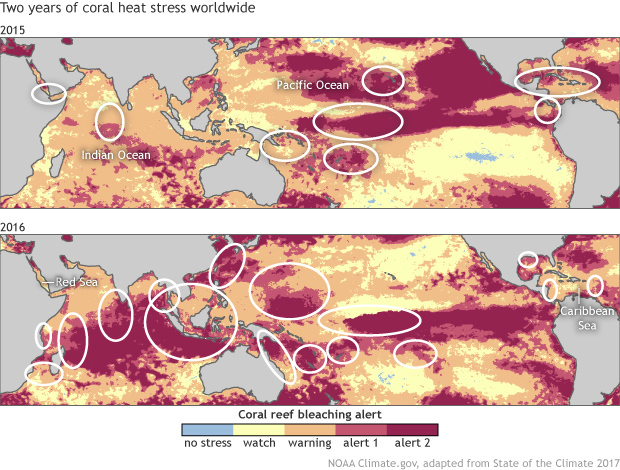 Alert 1 means coral bleaching is likely. 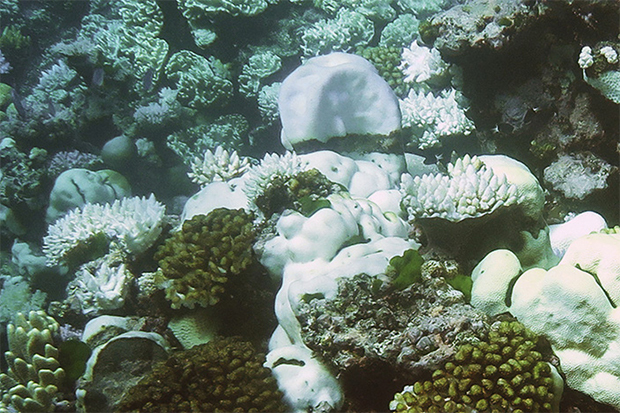 Alert 2 means widespread bleaching and significant mortality of corals are likely. 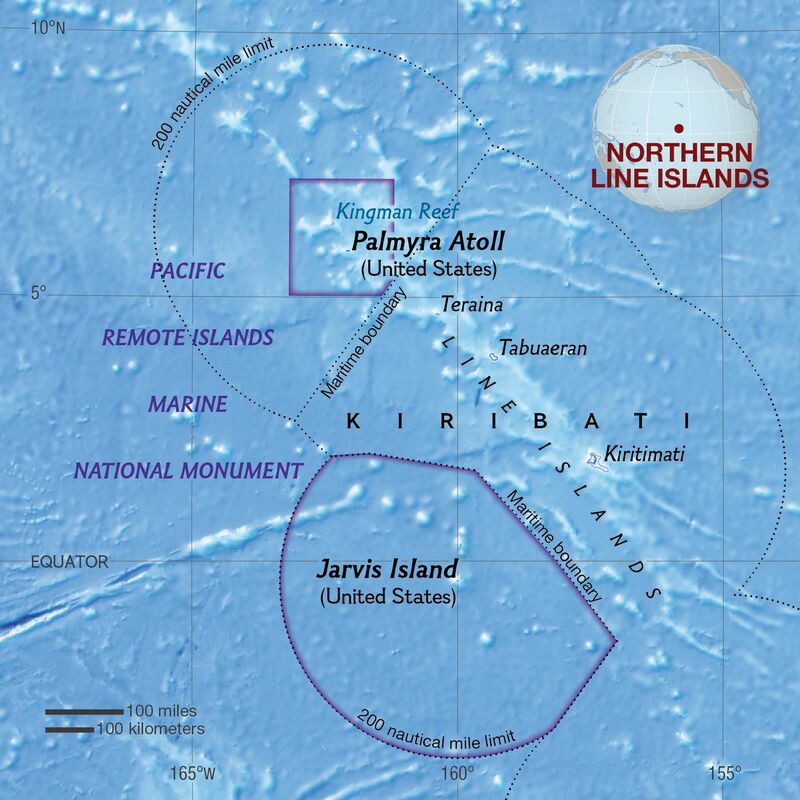 Severe coral bleaching was reported in areas circled in white. NOAA Climate.gov images adapted from State of the Climate in 2017, using NOAA Coral ReefWatch data (version 3.1). 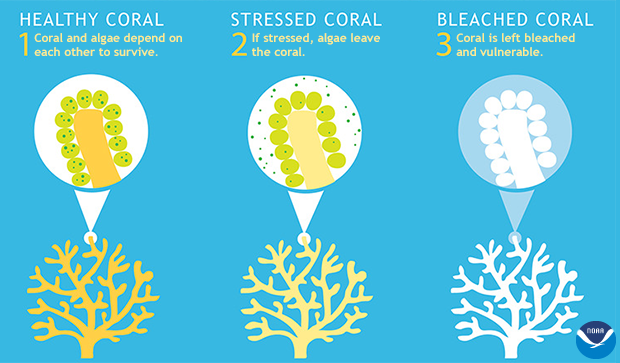 All of the corals that build the Earth's reefs have a symbiotic relationship with algae living inside them, and both corals and algae depend on this partnership to thrive. When stressed by high temperature and light levels, corals often expel their algae, turning white. A brief bleaching event doesn't necessarily kill coral—but prolonged, severe bleaching can lead to disease and starvation. Corals get their color from pigments in their symbiotic algae, which provide food to corals through photosynthesis. This partnership breaks down during periods of extreme heat stress, and the corals expel the algae. Click image to see the full, original infographic by NOAA's Ocean Service. The coral-bleaching event of 2014–2017 was unusual not just for its long duration, experts say, but also because it wasn't entirely due to El Niño. Though an El Niño was anticipated in 2014, it didn't really materialize until March 2015, yet bleaching-level heat stress was already well underway by that time. A strong El Niño arrived in 2016, and heat stress occurred at 51 percent of the world's coral reefs into early 2017, when a La Niña was in place. Bleached coral at Australia's Great Barrier Reef appear bone white compared to remaining healthy coral, which are golden brown and purple. Photo by Mia Hoogenboom, for ARC Centre of Excellence for Coral Reef Studies. Eakin, C.M., Liu, G., Gomez, A.M., De la Couri, J.L., Heron, S.F., Skirving, W.J., Geiger, E.F., Marsh, B.L., Tirak, K.V., Strong, A.E. (2018). Unprecedented three years of global coral bleaching 2014–17. Sidebar 3.1. [in State of the Climate in 2017]. Bulletin of the American Meteorological Society, 99(8), S74–S75.